It's way past time for thank yous. Please forgive me Margaret Simon for being so late. Too much company on Fridays made it a challenge to share either Christmas or New Year's. 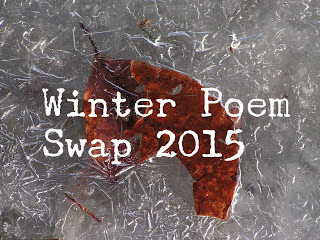 But isn't this wonderful to still be sharing our Winter Poem Swap treasures, still giving much pleasure. 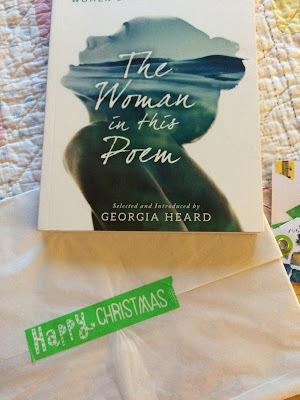 I received the following from Margaret right before Christmas, and am still reading and loving this new anthology from Georgia Heard. Thanks again to Tabatha Yeatts for organizing the Swap! 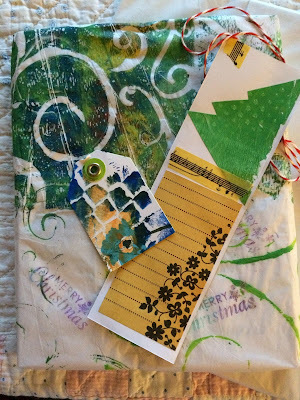 Margaret mentioned in one of her recent posts that she went to an art session where she learned to make gelli paper. I am intrigued by this kind of art, and hope I'll get to make some one day, but in the meantime, will enjoy the wrapping paper created and used for my gift. Also included is that wonderful bookmark and gift tag, more created by Margaret. ARE GONE, WE HAVE THAT 'SOFT SILENCE' HERE TODAY! Margaret wrote that a friend created the art above, and then she wrote the poem, both beautifully thoughtful to see and read. Thanks again Margaret and Tabatha for enriching my Christmas with poetry. You're welcome. It was lovely to open this Christmas package! Gorgeous! The whole thing. I love "turning toward home." I still have to do my thank you too. Thanks, Liz, I agree that it is special. Beautiful! So glad you shared. Thanks, Dori. It is indeed! So glad to see Georgia's new book as part of the gift-giving - I'm reading it, too, savoring it a bit at a time. I love that "soft silence" too, Robyn, especially today since it's snowing all day, the perfect time for the poem. I didn't know about Geogria Heard's book, so it is a delightful surprise! Thanks for sharing. 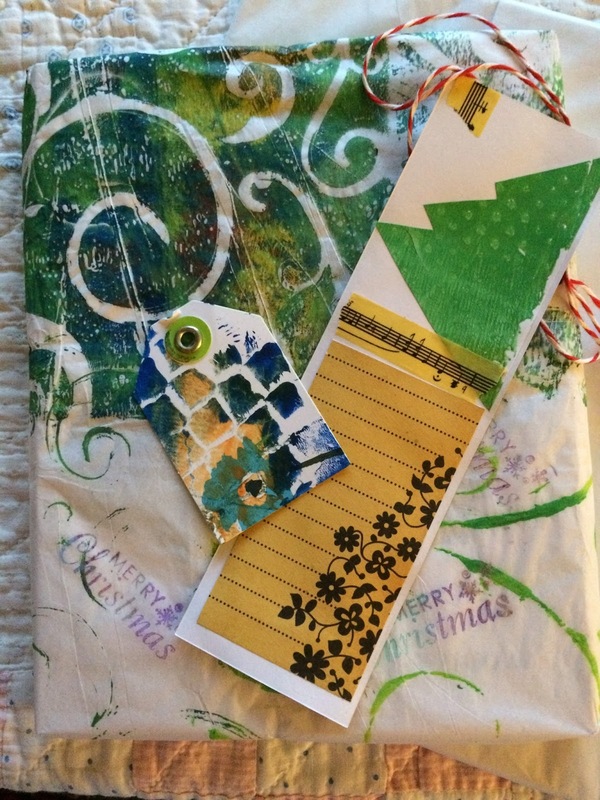 Love Margaret's poem, wrapping paper, bookmark and gift tag! I have that new anthology and am slowly making my way through it. :) Enjoy the snow where you are. The snow is still falling, gently this time, so just enough to make everything beautiful. 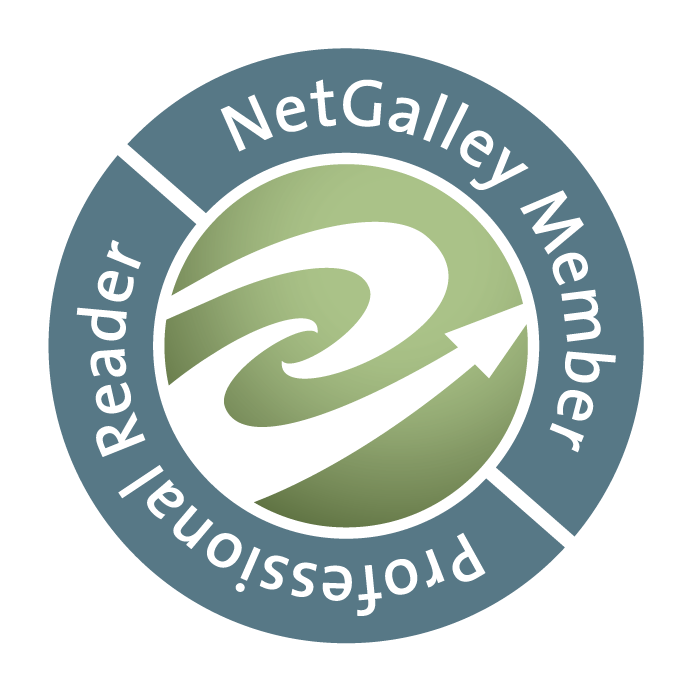 Thanks, Jama, glad you like those treasures from Margaret, & that you have the anthology! Thanks for sharing, Linda. I feel proud seeing my work on the page like this, a showcase of sorts. 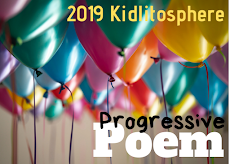 I love this practice of sending out poetry love! You are welcome, Margaret. You sent a beautiful & thoughtful gift! Thank you, too! I love this exchange between the two of you. The artwork, wrapping paper, bookmark, poem made wonderful gifts for Linda. In turn, Linda shared the generosity of the gift and words with all of us. How special! Thanks for noticing this small, yet important thing, a virtual hug between the two of us, right? So much beauty in this gift! Margaret is a woman of many talents. As was mentioned before, I like that "turning toward home." Thanks, Tabatha. I was lucky to have Margaret as a swap partner! Gorgeous poem! I must look into gelli paper! The swap is so much fun. Yes, it is a gift to remember, every time. That gelli paper is so interesting. Another blogger keeps posting what she does with it. Thanks, Donna. You're welcome, Bridget, so happy you enjoyed these treasures! Oh my, what a glorious gift of poetry and art, such a lovely way to close the year, Linda. Yes, it was a wonderful surprise. Thanks, Tara! What inspiring gifts! 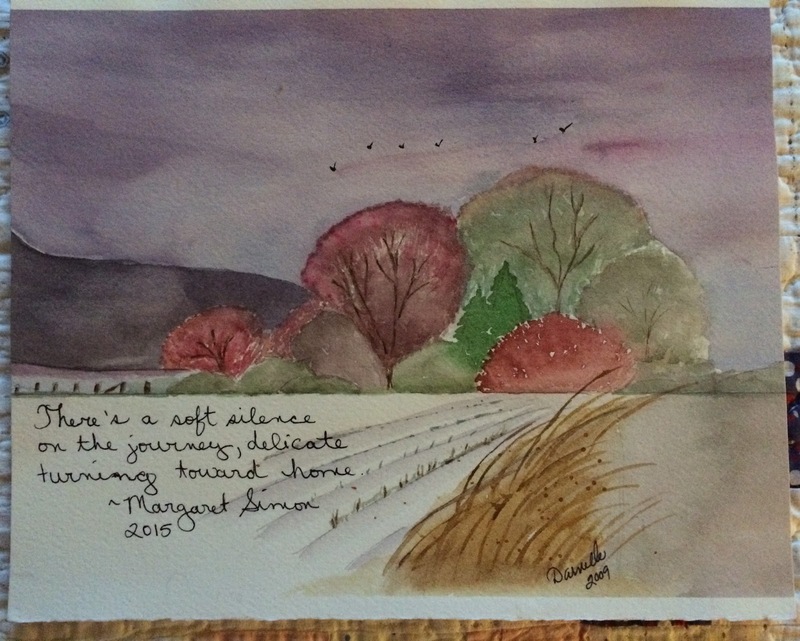 For some reason Margaret's poem reminds me of Frost's "Stopping By Woods on a Snowy Evening." It does imply a path or road, wending home, doesn't it? I do love it. Thanks, Violet. What a beautiful treasure! I am really wanting to take an art class and would love to have company. Want to do something together? Yes, Margaret's gift is very special! As for the class, I'm willing, sure. Will message you! Thank you so much for sharing your gifts with us! Silence can sometimes scream; I love "soft silence"--soft, comfortable in texture, like a comfy chair or sofa; soft, too, like a whisper that shares a secret. God bless you! Thank you for sharing Margaret's lovely gifts. I'm sure you'll enjoy curling up in the "soft silence" of home with Georgia's new book. Margaret has creativity oozing out of her fingertips! Love the paper and gifts. Enjoy! Thanks CB, Catherine, Mary Lee and Michelle. The poem gifts fit perfectly for our inside wintery days.